As predicted, this was a very productive week leading to a week with tons of visible progress. After messing with code stuff for a few days I now have an efficient way to put hundreds of moves, animations, and ponies in my game. The screenshot above is what the current Move Info interface looks like. If you click a question mark with a move selected in battle yo'll see this stuff pop up. Move type, power, accuracy, classes, description, elemental match-up, and so on. I think it'll be really useful to players so it should be accessible when and where you need it most. 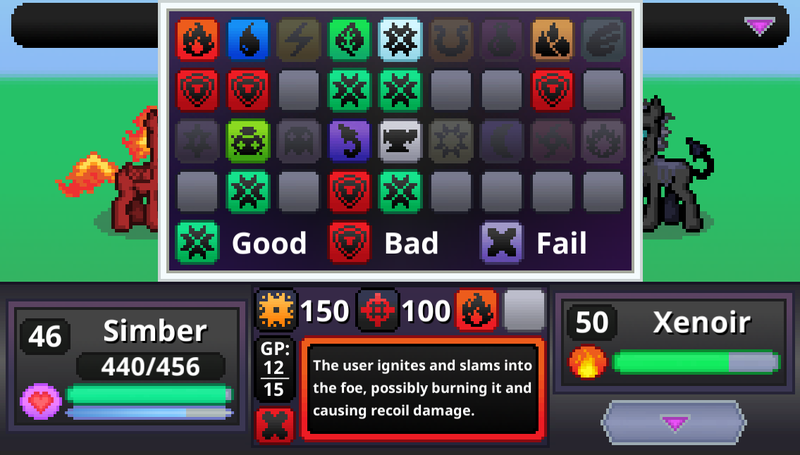 I considered just showing the Good, Fail, or Bad symbol above text next to the target but decided that it would be more beneficial to the player if they got the chance to memorize all the classes a move is strong against and get more familiar with all the classes. If you want to see what else I've been messing with this week, hop on over the page break. from this and put it in my games in any language! This week I made big progress code-wise. I can now read from CSV files in Unity which allows me to grab data from a spreadsheet rather than messing around with it in code. This makes debugging and updating easy. All I have to do is copy/paste the nicely formatted sheets to a new document, paste with the transpose option, save as a CSV, then convert that into a text file and drag it to my Unity folder. Combining this stuff with reading from normal text files to localize in multiple languages means I don't have to cram millions of lines into my Unity scripts and spend forever looking for errors. I just update the text file or easy-to-navigate spreadsheet and it'll work in my code. I'll be using this code for class match-ups, NPC trainer data, move data, inventory values, and pony balancing data too. I'll be putting analytics into my game before launch so I can track things like commonly used ponies and moves, story points where players quit, win loss ratios, and event participation. It'll be helpful for keeping the game alive in the long term and also help me out with the database portion of my senior capstone project. I made just under $7 this week and need to get used to the idea of $5 (or less) a week until BGP is released. I just received what's probably my last "big" deposit for Unicorn Training. That $50 puts me at the halfway point of getting the Macbook. I wonder if I can somehow stretch it to the end, or at least get close enough for m parents to help me (after some pleading). Amazon is removing its ad support services for programs that don't meet its requirements for the children's privacy act laws. Just about all my games are on that list, excluding the Unicorn Training games (likely because they have no ads, social networking, or in-app purchases). I'm not really hurt by this move since I use Google's AdMob and don't have plans to make any F2P games in the future. I can picture this becoming a huge problem as the market keeps pushing for this race to the bottom in pursuit of whales so I'll just avoid jumping on the bandwagon here. My free games will serve as advertisements to the full versions. No ads, no pay walls. I know that the COPPA laws have more to deal with than that, but those are just the thoughts that came to me while reading the emails and being thankful for not being ad revenue dependent. I'm sure some devs out there are really hurt by this. The Adventures in Equica: Unicorn Training trailer has finally reached 10,000 views! It's my most popular video by far and rightfully so given all the work I put into it.You can watch the trailer on YouTube if you haven't seen it yet. My goal is to make an even better trailer for Battle Gem Ponies when the time comes. There was a bit of chaos as I tried to find a symbol for Status moves. Those are the ones that do neither contact nor energy damage. Getting super stoked about how the game will look by next week. The battle interface should be fully functional by Sunday and I can finally start making the ponies hit each other and trigger a win/lose condition. At that point I'll officially have a basic playable game.